Format Alcor Micro USB flash drives that have Alcor Chip PID 9381 and VID 058F .Download Alcor Micro UFD MP Flash v1.1 and repair corrupted Alcor Chip controller . If you have a corrupted Alcor Micro USB stick that have Alcor Chip controller with VID =058F and PID =9381 .First you must be sure that your flash disk chip genius report have the following information " Chip vendor "Alcor Micro " Chip vendor Model AU69XX with VID 058F and PID 9381 . 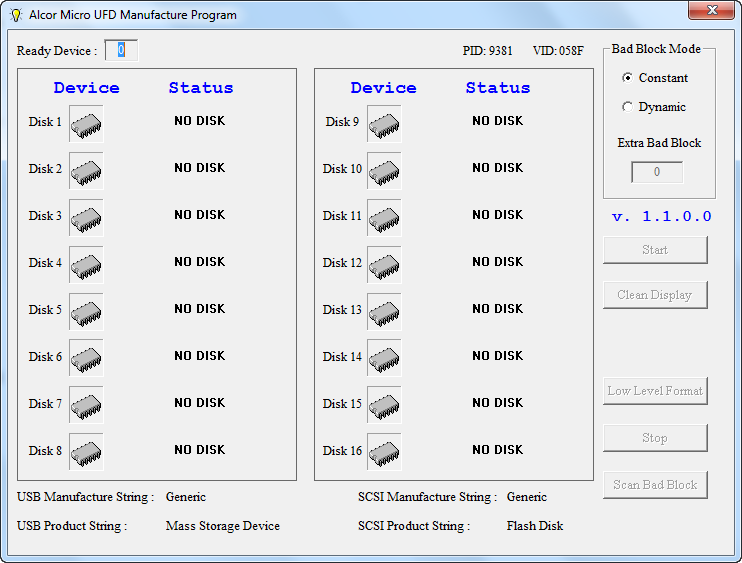 Alcor Micro UFD MP Flash v1.1 has been designed to reformat Alcor USB flash disks that have VID 058F and PID 9381 .Alcor Micro UFD MP Flash v1.1.0 format utility can fix format errors such as write protected memory ,please insert disk error message , No media error message ,Windows unable to format disk error message and other format issues . you must know your flash chip vendor first before using any flash drive firmware ,,you can use Chip genius software or USB Deview V2.30 utility. 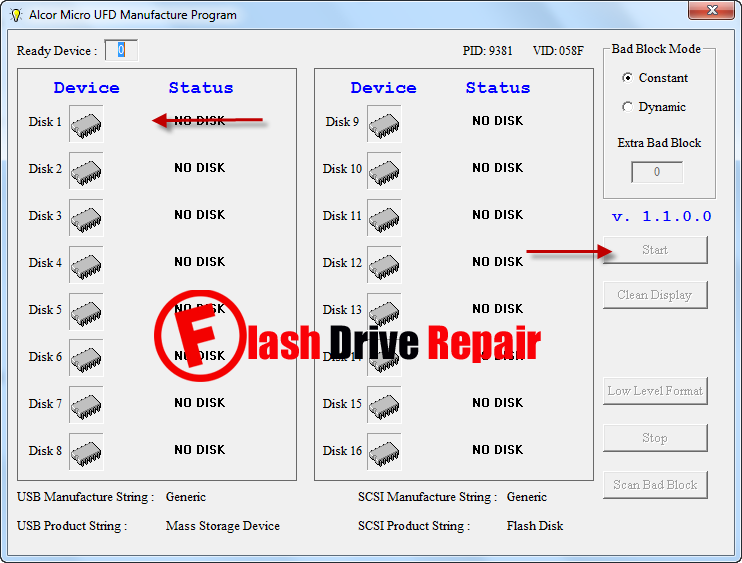 How to format corrupted Alcor flash drive ? First Download Alcor Micro UFD MP Flash v1.1.rar from download links in the end of this article . Extract Alcor Micro UFD MP Flash v1.1.rar and open AlcorMP_9381_DBB.exe and install it on your PC . Insert corrupted Alcor flash drive to your computer . Open AlcorMP_9381_DBB.exe , if your flash drive match the requirements , you will see your flash drive information appears on the program interface . My old, old generic Flash Drive USB 64MB shows up as VID:058F PID:9381 (Alcor Micro) so you'd think that you'd use the AU9381 Production tool which when the drive is inserted shows "DISK READY" but after pressing "Start" one receives the error "Get Chip Number Fail". After figuring out how to open it up to get to the PCB, there one finds the Alcor controller AU9386. So I'll try production tool for that flash controller next.